Author contributions: Fallucca F and Pianesi M conceived and designed the manuscript; Fallucca F, Fontana L and Fallucca S searched the literature and selected relevant studies; Fallucca F and Fontana L drafted the manuscript; Fallucca S and Pianesi M critically reviewed the manuscript drafts; all authors read and approved the final manuscript. Conflict-of-interest: The authors declare that they have no conflicts of interest. In the past 10 years the prevalence of type 2 diabetes mellitus (T2DM) has increased hugely worldwide, driven by a rise in the numbers of overweight and obese individuals. A number of diets have been shown to be effective for the management of T2DM: the Mediterranean diet, the vegetarian diet and the low-calorie diet. Results of studies clearly indicate, however, that the efficacy of these diets is not solely related to the biochemical structure of the individual nutrients they contain. This review discusses this point with reference to the potential role of the intestinal microbiota in diabetes. The macrobiotic Ma-Pi 2 diet is rich in carbohydrates, whole grains and vegetables, with no animal fat or protein or added sugar. In short- and medium-term trials conducted in patients with T2DM, the Ma-Pi 2 diet has been found to significantly improve indicators of metabolic control, including fasting blood glucose, glycosylated hemoglobin, the serum lipid profile, body mass index, body weight and blood pressure. The diet may also alter the gut microbiota composition, which could additionally affect glycemic control. As a result, the Ma-Pi 2 diet could be considered a valid additional short- to medium-term treatment for T2DM. Core tip: Imbalances in the intestinal microbiota (dysbiosis) have been linked to diseases, including diabetes. In short- and medium-term trials conducted in patients with type 2 diabetes mellitus (T2DM), the Ma-Pi 2 diet, which is rich in carbohydrates, whole grains and vegetables, with no animal fat or protein or added sugar, has been found to significantly improve indicators of metabolic control, including fasting blood glucose, glycosylated hemoglobin, the serum lipid profile, body mass index, body weight and blood pressure. The diet may also alter the gut microbiota composition. Hence, the Ma-Pi 2 diet could be considered a valid additional short- to medium-term treatment for T2DM. In the past 10 years, the prevalence of type 2 diabetes mellitus (T2DM) in Italy has increased greatly; currently, approximately 3.3 million people are diagnosed with T2DM (5.5% of the total population) and another million people are thought to be affected but as yet undiagnosed. These numbers are expected to increase in the near future, and it has been estimated that 9.0% of the population will have T2DM by 2030. Similar increases are anticipated in other European countries and, globally, the number of people with diabetes is predicted to reach 592 million by the year 2035 - an increase of 55% from 2013 data. This increase in the prevalence of T2DM, which accounts for approximately 90% of all diabetes cases, is clearly being driven by an increase in the numbers of individuals who are overweight or obese. Indeed, the risk of diabetes appears to literally soar as the weight piles on; a rise in body mass index (BMI) from 21 kg/m2 (healthy) to 35 kg/m2 (obese) can increase the likelihood of developing the disease by a factor of 80. In line with the increase in prevalence of diabetes, the number of obese adults, together with the rates of obesity-related diseases (e.g., coronary heart disease and stroke, hypertension and arthritis) and associated healthcare costs, are all expected to increase dramatically worldwide over the next 20 years[4,5]. T2DM and obesity, and their associated complications and costs, are therefore among the most pressing healthcare problems that society is currently facing. Despite improvements in our understanding of T2DM and the development of new diagnostic and treatment methods, we are still failing to control this epidemic. There is a crucial need to find effective, simple, pragmatic, sustainable and cheap interventions (e.g., those aimed at changing lifestyle, such as exercise and diet). Recent reviews highlight the benefits of physical exercise in T2DM. In Italy, the Italian Diabetes and Exercise Study[7-10] has contributed to this evidence and has helped provide definitions and standards used by the American College of Sports and Medicine and the American Diabetes Association (ADA). Yet, despite the accepted benefits of physical exercise for patients with T2DM, the implementation of exercise recommendations has proved difficult. Reasons for this include a lack of patient compliance, insufficient knowledge/awareness of benefits among general practitioners, diabetologists or exercise professionals, and a lack of dedicated facilities. In addition, in order to be successful, exercise interventions in individuals with T2DM tend to require intensive counseling and supervision from medical or exercise professionals. As a result, recent attention has focused less on exercise and more on diet; dietary therapy (as a lifestyle intervention), with or without additional drug treatment, represents an efficacious and safe alternative for T2DM management. Various cohort studies have shown that selected healthy eating patterns, mainly characterized by a higher intake of fruit and vegetables, are associated with a lower risk of diabetes. In this review, we look at some of the various diets that have been shown to be effective for the management of T2DM, in particular the Ma-Pi 2 macrobiotic diet, and explore the potential role of the intestinal microbiota in T2DM. A Mediterranean-type diet is one involving: a high consumption of cereals, grains, fruits, vegetables, legumes, nuts; olive oil as the principal source of fat; low-to-moderate consumption of fish and poultry; relatively low consumption of red meat; and moderate consumption of wine, normally with meals. Based on this definition, numerous epidemiological studies have indicated the favorable effects of this diet[15-17]. Such diets have been reported in two prospective studies[18,19] and one intervention study to be associated with a reduced risk of diabetes. However, the role of the Mediterranean diet in weight control remains controversial, which suggests that the protective effect of this diet against diabetes are not based on weight control but through several of its dietary characteristics. Currently it is unclear which component of the Mediterranean diet contributes most to its favorable effects. Weight loss following a reduction in energy intake (caloric restriction) and/or an increase in energy expenditure (through exercise) improves insulin sensitivity, hyperglycemia and other cardio-metabolic risk factors. Caloric restriction (CR) is defined as a reduction in caloric intake by around 20%-40%, with adequate intakes of protein and micronutrients to avoid malnutrition[23,24]. Caloric intake can be reduced by eliminating the consumption of energy-dense foods (e.g., refined carbohydrates, potatoes, white bread, white rice, sweets and sweetened drinks) and by increasing the intake of a nutrient-dense foods (a wide variety of vegetables, fruits, nuts, low-fat dairy products, egg whites, wheat and soy proteins, fish and meat). The energy intake of such a diet is around 1100-2000 kcal/d, with approximately 26% of calories obtained from protein, 28% from fat and 46% from complex carbohydrates. CR may be administered as a short- (1 mo-1 year) or long-term diet. CR in healthy individuals as well as those who are obese or have T2DM has been reported to lower blood glucose levels, fasting insulin values and BMI. Weight loss induced by caloric restriction mediates a reduction in inflammatory markers and improves insulin resistance and sensitivity. With adequate nutrition, CR can improve cardio-metabolic health, prevent T2DM and may be a powerful tool against obesity and insulin resistance. Vegetarian diets typically include large amount of fruits, vegetables and legumes, nuts and soya-protein and usually aim to eliminate all animal products. Studies have shown that, generally, vegetarians residing in Western countries have a lower BMI and a higher ratio of polyunsaturated to saturated fat intake than individuals consuming a non-vegetarian diet (people eating meat and/or fish)[27,28]. Vegetarians have also been shown to have lower concentrations of low-density lipoprotein (LDL)-cholesterol[29-31], lower blood pressure[32,33] and a lower risk of diabetes than non-vegetarians. Factors associated with the higher fiber content in vegetarian diets promote increased insulin sensitivity. Vegetarian diets are also associated with other health benefits. According to the largest study ever conducted in the United Kingdom from the University of Oxford, the risk of hospitalization or death from heart disease was 32% lower in vegetarians than in people who ate meat and fish, with most of the difference in risk probably caused by effects on cholesterol and blood pressure. In addition to a lower risk of cardiovascular disease[37,38], vegetarian diets have been reported to reduce the incidence of cancer in a low-risk population[39,40]. The results of some studies indicate that the efficacy of a diet is not solely related to the biochemical structure of the individual nutrients it contains and the current standard definition of macronutrients fails to capture important information. This has become more obvious as knowledge of the gut microbiota[42-46] has been gained and the “food as hormone” hypothesis has emerged. The human gut microbiota weighs about 1500 g and the number of intestinal microbial cells it contains is tenfold greater than the total number of human body cells. The gut microbiome, which represents the collective genomes of all gut microbiota, is 150 times greater than the human gene complement. The gut microflora plays several metabolic active roles: it produces vitamins, synthesizes amino-acids, transforms bile acid, and is able to ferment non-digestible substrates and endogenous mucus, stimulating bacterial growth and producing short-chain fatty-acids (SCFA), which work in the gut and at distance after absorption. Moreover, the gut microbiota also causes pathogen displacement, by competing for attachment sites and nutrients, and by secreting antimicrobials. The microbiota plays a fundamental role in the development of the immune system, as SCFA have a strong immunomodulatory activity, leading to the production and release of cytokines, chemokines and phagocytes. The gut microbiota is also involved in the development of cells and tissues, and is responsible for the integrity of the gut barrier through its involvement in glucagon-like peptide (GLP)-2 production by enteroendocrine L-cells, and the circulation of endotoxins. In addition, the microbiota triggers the production of peptide YY, which regulates gut motility and the hungry sensation. Dysbiosis is a bacterial imbalance in the gut resulting in a modification of the normal local distribution of microbial communities that correlates with biochemical and clinical modifications in the host: hyperglycemia and T2DM have been observed in the presence of a low percentage of bacterial Firmicutes and Clostridia species. Diet and increase in bodyweight are linked to gut microbial imbalance, in both the presence and absence of obesity. Recent studies have shown a link between dysbiosis and several diseases, including diabetes (Figure 1). Figure 1 Articles indexed in PubMed concerning the microbiota and human diseases. 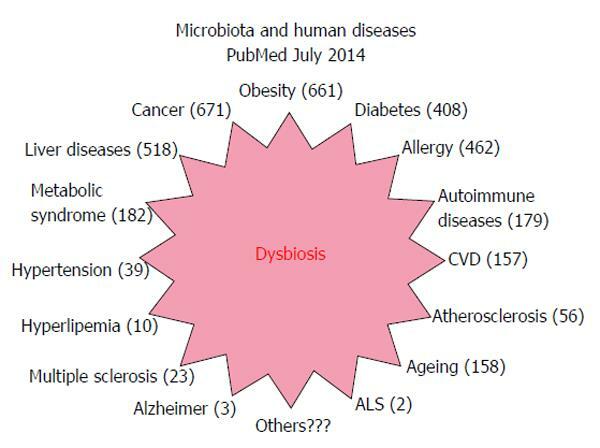 Results of a research in PubMed looking for articles concerning gut microbiota that associated dysbiosis and human diseases. Number of articles for each kind of disease is indicated in brackets. CVD: Cardiovascular diseases; ALS: Amyotrophic lateral sclerosis. Obesity and T2DM are associated with chronic low-grade inflammation and endotoxemia. Lipopolysaccharide (LPS) consumption and a diet rich in fat increase adiposity, impaired glucose tolerance, and insulin resistance those raises are reversible by the consumption of a pre-probiotic rich diet[44,58,59], or a meal based on fiber and fruit, as recommended by the American Heart Association. Bacterial LPS derived from Gram-negative bacteria residing in the gastrointestinal microflora could act as a trigger for the development of diabetes and obesity; in a series of experiments in mice, it was observed that high-fat feeding favors an increase in the Gram-negative to Gram-positive colonizing bacteria ratio, which has been associated with an increased intestinal permeability that precedes the development of metabolic endotoxemia, inflammation, and associated disorders (obesity and diabetes). Different nutrients have different enhancing-effects on endotoxemia (LPS production by microflora or for higher gut permeability) and the consequent inflammatory response. Other factors may also influence our microbiota, such as age[62-64], chemical products and antibiotics, and prebiotics and probiotics[58,66-68]. The internationally endorsed definition of probiotics is “live microorganisms which when administered in adequate amounts confer a health benefit on the host”, whereas, definition for prebiotics is “a selectively fermented ingredient that allows specific changes, both in the composition and/or activity in the gastrointestinal microflora, that confer benefits upon host well-being and health”. Therefore, in order to be classified as a prebiotic, the ingredient should resist gastric acidity, hydrolysis and should be fermented by the intestinal microflora. The consumption of prebiotic foods enhances a reduction of triglyceride and postprandial glucose levels, gut permeability and inflammatory effect[66,70]. It has been observed that administering prebiotics to obese mice induces a microbiota modulation, lowering both diet-induced LPS endotoxemia, and systemic inflammation and liver inflammation. The main positive effects of pro- and prebiotic administration are increases in GLP-1 and peptide YY secretion[71-73], a reduction in the complications of pregnancy, and improvements in metabolic diseases (obesity, T2DM, cardiovascular disease). New findings in microbiota knowledge are opening new fields of study about human health and disease. However, the research regarding the interaction between bacteria and human health is at the beginning and many aspects are still not properly understood; well-defined clinical studies are needed in order to develop the potential of this new therapeutic area. Until now, scientists have focused primarily on identifying human genetic markers, but research has shown that other factors, such as the intestinal flora, play a role in the development of T2DM[45,46]. The results of metagenome-wide association studies in T2DM patients and non-diabetic controls[45,46] clearly indicate that T2DM is a significant factor in the observed variation in gut microbial samples, and suggest that the gut microbiota in T2DM patients features dysbiosis. These studies[45,46] indicate that a gut-microbiota-based index could be more effective and accurate in assessing and predicting the risk of T2DM than a human genome variation-based one. Knowledge of the microbiota and the general concept of “food as hormone”, as proposed by Ryan et al, suggest that diet has an enormous impact on our health. In fact, circulating substrates derived from food have both direct and indirect actions and, ultimately, food may be considered a cocktail of hormones that exert their effects on target tissues, activating cell-surface or nuclear receptors. Food components also interact with the gut flora to induce indirect signals. Therefore, if we consider this new role for food, we can make dietary recommendations to promote health or treat specific diseases, taking into account that until now macronutrients have been classified according to their energy-yielding biochemical properties and not by their ability to work in a manner similar to that of hormones. Identifying these food- and food metabolite-receptor interactions will provide new opportunities for studying the relationship between the food we eat and diseases, including obesity. Macrobiotic diets are originally derived from an ancient Eastern philosophy of life based on two ancient Asian theories (Yin/Yang and the Five Transformations), formulated for Western culture by the Japanese philosopher Georges Ohsawa and further updated by Mario Pianesi who created the 5 Ma-Pi diets. The Ma-Pi 2 diet was specifically designed for patients with metabolic disorders, and consists of 50%-55% whole-grain (rice, millet and barley), 35%-40% vegetables (carrots, savoy cabbage, chicory, red radish, onions, parsley, cabbage) and 8%-10% legumes (adzuki beans, chickpeas, lentils and black beans), plus gomashio (roasted ground sesame seeds with unrefined sea salt), and fermented products [miso, wandadou jiangyou (soy sauce) and yanzimei (pickled ume plums)], which could have probiotic effect; seaweeds [Kunbu (Laminaria japonica, Aresch), Qundaicai (Undaria pinnatifida, Harv. ), Haitai (Porphyria tenera, Kjell.) and Hiziki (Sargassum fusiforme, Harv.)] and Beicha tea (caffeine-free green tea). The daily average energy intake is in the range of 1700-2200 kcal (12% from proteins, 18% from fats and 70% from carbohydrates, mainly complex). The Ma-Pi 2 diet contains, on average, 18% saturated, 46% monounsaturated and 36% polyunsaturated fat, with no trans-fatty acids and an n-6:n-3 polyunsaturated fatty acid ratio of 5:1. It provides nutrients and phytocompounds with antioxidant, hypoglycemic and hypolipidemic effects, such as vitamin C, β carotene, magnesium (average 700 mg/d), manganese (average 16 mg/d), zinc (average 15 mg/d), chromium, phytosterols (average 326 mg/d), dietary fiber (average 50-60 g/d), inulin (average 9 g/d), polyphenols, tocotrienols, folates (more than 500 μg/d), quercetin, and prebiotic and probiotic products. The Ma-Pi 2 diet excludes all animal products, (including egg and dairy), and has no added sugars. All of the ingredients used to prepare the Ma-Pi 2 diets are grown, stored and processed without the use of synthetic chemicals. The crops are from old seed varieties, which were produced using natural methods. All of the products used are labeled, providing detailed information on the origin and characteristics of the product and its supply chain (the Pianesian Transparent Label). The nutritional content of one Ma-Pi 2 diet used in a clinical study in T2DM patients is presented in Table 1. Table 1 Example of the average daily energy and nutrient intake for the Ma-Pi 2 diet during in one dietary intervention study. 1mg of amino acid per gram of protein. Since 2001, various clinical studies have been carried out to assess the effect of the Ma-Pi 2 diet in T2DM patients. Single-arm studies of the Ma-Pi 2 diet in patients with T2DM conducted in several countries and continents (e.g., America, Asia, Africa and Europe) have consistently shown that consumption of the diet for 3 or 6 mo resulted in statistically significant improvements from baseline in indicators of metabolic control, including fasting blood glucose (FBG), glycosylated hemoglobin (HbA1c), the serum lipid profile [including reductions in total cholesterol, LDL cholesterol and triglyceride values, and the LDL:high-density lipoprotein (HDL) cholesterol ratio], BMI, and insulin resistance, as well as body weight and blood pressure (P < 0.001) (Table 2)[79,80-84]. These results were apparent even in patients with poor glycemic control (HbA1c > 8.5%). In patients being treated with insulin, use of this agent fell during the intervention[79,85]. Table 2 Metabolic effects of the Ma-Pi 2 dietary intervention after variable periods of time. Taken from the results of studies investigating the Ma-Pi 2 diet in men and women with type 2 diabetes over variable periods. ↑: Increase; ↓: Decrease; ↔: No effect; HbA1c: Glycosylated hemoglobin; HDL: High-density lipoprotein; LDL: Low-density lipoprotein. Similar results were obtained later in short-term (21-d) intervention studies[86,87], thus demonstrating the ability of the diet to achieve rapid metabolic control. The first randomized, controlled trial comparing the Ma-Pi 2 diet (in 25 participants) with Italian dietary recommendation for T2DM (in 26 participants)-the MADIAB trial-was carried out in 2013. After 21 d on the prescribed diet, which was administered under supervised conditions, the average daily energy intake was 1803 kcal (12% protein, 15% fat, and 73% complex carbohydrates, with 29 g/1000 kcal fiber) in the Ma-Pi 2 group and 1798 kcal (18% protein, 32% fat, and 49% complex carbohydrates, with 20.5 g/1000 kcal fiber) in the control group (P = 0.860). The multivariate analysis (adjusted for age, gender, BMI at baseline, and physical activity) showed that significantly higher percentage reductions in FBG, postprandial blood glucose (PPBG), HbA1c, total cholesterol, LDL-cholesterol, LDL:HDL ratio, BMI, weight, waist and hip circumference, and insulin resistance were seen in the Ma-Pi 2 group than in the control group. Although the triglyceride levels were reduced in all subjects, the reduction detected in the controls was significantly higher than that in intervention subjects. Furthermore, all subjects in the Ma-Pi 2 group achieved FBG and PPBG target levels (< 110 mg/dL for FBG and < 140 mg/dL for PPBG) at the end of the 21-d dietary treatment. Further results from this trial, presented at the 2014 ADA 74th Scientific Sessions, have also demonstrated that the Ma-Pi 2 diet is a safe strategy by which to reduce markers of insulin resistance and inflammation. In addition, a significant reduction in insulin-like growth factor-1 was observed in the Ma-Pi 2 subjects vs the controls (P < 0.001). The MADIAB trial is also currently assessing the hypothesis that the Ma-Pi 2 diet may affect the composition of the gut microbiota to a greater extent than the control diet. The results of this analysis will be published later this year. These results strengthen the idea that the Ma-Pi 2 diet could play an important role in the treatment of T2DM, as whole cereals, non-animal fats and protein, and the high fiber content (> 50 g/d) and probiotic presence could improve gut microbiota composition, favoring a reduction in inflammation and insulin resistance. Eliminating all animal products from the diet may increase the risk of certain nutritional deficiencies in some micronutrients such as vitamin D, calcium, iron, zinc and long-chain n-3 (omega-3) fatty acids. However, the Ma-Pi 2 diet content of those micronutrients seems to be adequate[77,79]. Special concern should be given to possible deficiencies of vitamin B-12, even though clinical evidences for deficiency in this vitamin are described only after several years of insufficient consumption. The MA-PI 2 diet was especially conceived for the treatment of T2DM and studies in adults with T2DM consistently showed that a 3 or 6-mo consumption of the Ma-Pi 2 diet was nutritionally safe, at least for the evaluated time[79-83,85]. These evidences suggest that Ma-Pi 2 diet can be used as a short- and medium-term treatment, aimed to achieve a good metabolic control and that further research is needed to demonstrate the safety of this diet in the long-term. However, currently available studies on the Ma-Pi 2 diet in patients with T2DM have a number of limitations, such as the use of relatively small sample sizes. This was due to the particular design of the studies, where subjects were required to dwell in isolated environment 24 h per day, in order to ensure a good compliance to the diets[80-85,87-89]. However the MADIAB randomized trial was adequately powered and corroborative analyses were performed to ensure consistency and robustness of the clinical trial results. Other limitations in available studies on the Ma-Pi 2 diets include their short- or medium-term durations and the fact that, in some studies, participants (in both the intervention and control groups) were studied in a supervised environment[84,85,87-89]. Subject compliance to dietary recommendations for T2DM are required to obtain clinically significant changes in outcomes, and improvements obtained with dietary interventions in clinical trials are not easy to reproduce in daily life. Future studies should aim to address all of these issues. A variety of diets have been shown to be effective for the management of T2DM, including the Mediterranean-style, vegetarian and low-calorie diets. However, the Ma-Pi 2 diet, in both uncontrolled and controlled short- and medium-term trials conducted in patients with T2DM in several countries and continents, has been found to achieve a speed of metabolic control that has not been reported in studies of other diets. This finding could be attributable to the composition of the Ma-Pi 2 diet, which is high in whole grains, vegetables and legumes, and fermented products, with no animal products and no added sugars. These characteristics allow to improve glycemic control, reduce insulin requirements, improve insulin sensitivity, lower blood cholesterol and triglycerides, reduce body weight control, and lower systemic blood pressure. The dietary habits may also modify the gastrointestinal microflora composition, which could influence glucose control. Hence, the Ma-Pi 2 diet could be considered a valid additional short- to medium-term treatment for T2DM, particularly when glycemic control needs to be rapidly improved. Further research is needed to demonstrate the efficacy of this diet in the long-term management of T2DM.